This private home is nestled in the forest of the Sierra foothills inside the Tahoe National Forest. 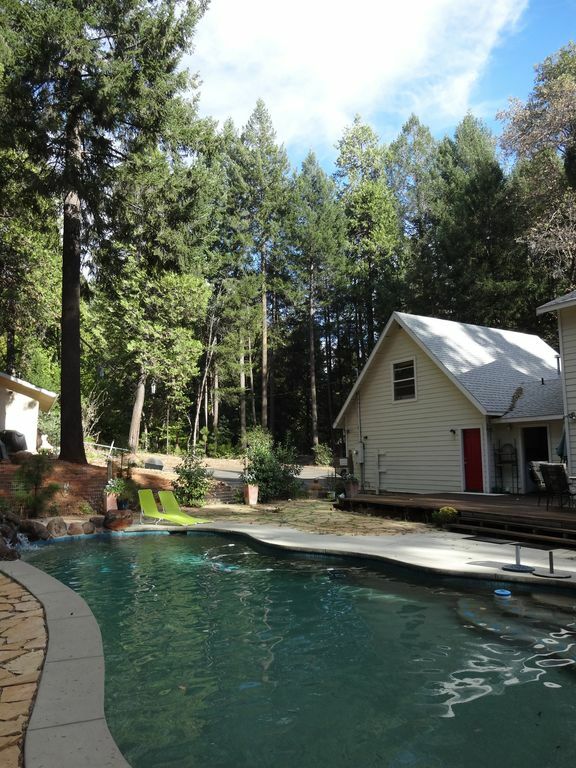 Conveniently located to local wedding venues and a jump to the Western States Trail, this spacious, quiet and private home is close to all of the venues in and around Foresthill, California, the epicenter of northern California outdoor living. We aim to provide everything you'll need for a comfortable and clean experience on 3 acres of private residence. Each of the bedrooms are extra large making for comfortable quarters. Please read the detailed descriptions and view our gallery to imagine your stay here! Spacious kitchen offering international spices and generously stocked pantry with the essentials for the chef. Formal/informal place settings. Laundry facilities and ample storage. Guests must provide and prepare their own meals. Just bring yourself and be ready to relax by the 40' lap pool! Note that pool is sun-heated only, and may be brisk depending on time of year and weather conditions. On site massage services available with advanced, paid appointment. Very clean home. General: Strict NO PET/NO SMOKING Policy, though guests may smoke outdoors. Please, no parties/events on premises. Contact owner for details and particulars prior to securing your reservation, especially interested in any requests to make your stay extra special! I look forward to assisting in the creation of wonderful memories! Licenced. Member Foresthill Divide Chamber of Commerce. Thank you for allowing us to share in the making of wonderful memories! This property is an excellent choice, we sincerely wish you a very pleasant stay. We are friendly and approachable so please do not hesitate to let us know if you need anything special or want information on things to do or places to see! We are happy to help! This property was purchased and passed down to me by my parents, so it has sentimental history attached. The reason why they chose this parcel was because of the various species of older trees on this 3 acres of privacy. I remember being 8 years old coming here in the 60's they pondered their plans for it. Unfortunately their plan did not come to fruition, but ours did! My husband and I built this home in 1997 to raise our family. You'll feel a million miles away from civilization here but in actuality, you're less than 2 miles from town and popular venues in Foresthill. Our home is very clean and comfortable, and has a warm atmosphere. We've had countless happy times here and sincerely wish for you to enjoy it as much as we have! The bedrooms are pretty large, bright and unique. As you step outside, again, wonderful spaces to enjoy. Refresh yourselves in the summer months by swimming morning laps in our pool after a nice cup of coffee on the back deck. Evenings are equally as beautiful under a blanket of stars with silhouettes of large trees towering the perimeter. Quiet and private. toilet, combination tub/shower, Upstairs and shared between the two jack-and-jill rooms. Local only, no long distance. Verizon cell reception. We have a hard time with other carriers. Internet calls or skype would be advised as a back-up. Phone card is a suggestion. Central heat throughout house. Master has it's own wall furnace in addition, activated during winter months. Of course, the wood stove provides ample heat and ambiance. All sheets, bedding and extra blankets/pillows provided. Bring a sleeping bag in case you decide to sleep on the back deck. Extra large, sterilizing front loader available. Help yourselves to the detergent in the cupboard above. Please adhere to the special operating instructions provided on the machine. Thanks! Of course we have a clothes dryer! We also have a clothes line outside should you have larger, wet items you would like to hang dry. Plenty of parking in the driveway (3-4) cars. Additional parking off the driveway if necessary. Please observe the "No Parking" areas. Thanks in advance. Yes. Password on dry board in office area. Ample towels, including sunbathing towels provided. Our living area houses the wood stove, large screen TV and extra large couch with ottoman. Enough room for a family to snuggle together. Larger refrigerator/freezer with ice maker and the BEST WATER you ever had! Help yourself to existing, unique condiments and refrigerated cooking seasonings. Very nice 5 burner propane stove, high and some lower BTU's. Spills easy to clean. I like it! Very large oven should you choose to bake a giant turkey, however I suggest the more economical counter oven that roasts a nice sized chicken. Two coffee makers for caf/decaf; electric kettle for quick, boiling water. Help yourselves to a plethora of spices and seasonings. Essentials available, help yourselves to whatever you need! Large kitchen with island and plenty of counter space for a family who likes to cook together! Completely open to dining area so everyone can enjoy each other's company while cooking. Lovely dining table with 2 leaves to extend length. 8 chairs but can seat 10 comfortably. Large flatscreen HD TV located in living area. Not a Bose, but pretty decent unit with GREAT sound! CD/tape player. Enjoy our small, but informative library. A few classic family games. Will be adding a few more soon. Plenty of eclectic music to enjoy. Will be adding more as time goes on. Enjoy some of our family favorites. Unique and hard to find movies, classics, old scary movies and three stooges, etc. Please return all videos in their prospective sleeves and storage area. GREAT area for this activity, though must bring your own. NO EQUIPMENT PROVIDED. Avid cyclist area, though you must bring your own. NO BICYCLES PROVIDED. Near lakes that allow boating. Bring your own, no boats provided. Quiet front deck and large back deck in pool area, all with forest views. Relatively close to ski resorts, most likely a day trip. NO EQUIPMENT PROVIDED HERE, though may be rented in Auburn or ski resort. Several courses in Auburn and surrounding areas. Massage / Bodywork Therapy available upon prior paid appointment. Refund same as booking specifications. Contact owner for details. ADDITIONAL CELL SERVICE/WIFI NOTE: Due to the nature and location of our area, cell service best with Verizon, though not always strong. Our internet service is not always reliable and be prepared should it be offline on occasion. Nevertheless, bring laptop/tablet for internet calls should you not receive cell service. We want your visit to be absolutely as comfortable as possible. Though I can't imagine what more you could need, please do not hesitate to contact me should you have special needs or requests. Again, we are happy to help and want you to have wonderful experiences throughout your stay! Anna Maria was so nice, accommodating, and helpful. We loved the house, the location, and the pool. We hope to make it back soon! Thank you Donald, for this lovely review. We enjoyed hosting you and your family and welcome you back anytime. Hope to see you soon! Beautifully kept home, very clean, everything you need to stay there (including sufficient cooking needs, seasoning, condiments, etc). I have now stayed here multiple times and my favorite part of the house aside from the quiet location is the sectional sofa for relaxing with friends and napping! Owners are always responsive, location is close enough to conveniences you need but far enough away to be quiet and relaxing weekend. Pool is a perk after long days on the trails (running, biking, hiking). Beautiful house in a quaint setting! The house was beautiful, cozy and very welcoming. It is very evident that the Owners take great pride in their house and provide great hospitality to accommodate guests. I would highly recommend this property to families or friends who are looking for a quaint mountain setting in a great location. We recently enjoyed a very pleasurable stay at A Foresthill Retreat. It was a wonderful location surrounded by trees and peace and quiet. A great way to spend a weekend away from the City and all its commotion! We had all the comforts of home and our host even left us a bottle of wine to enjoy (which we did)! The place was very clean and spacious and provided all the accommodations anyone would need. Thank you, Anna Maria, for sharing your property with us and for providing a great getaway weekend! Amazing home with a beautiful pool to relax at! Me and some friends stayed at this lovely home, while attending a wedding nearby. It was a great place to relax, bbq and enjoy the sun by the pool. We were welcomed with a bottle of wine and fresh fruit which was a great touch! Thank you Trish for your lovely comments. You and your guests are always welcome here, it has been a pleasure hosting you! Hope to see you again in the future! Whenever we are traveling to the area we always stay here, 4th time to date, which says a lot I think. The home is clean, comfortable and relaxing. It has the amenities you need for a nice relaxing trip and close to beautiful outdoors. The owner is extremely responsive for any questions in prep for the your stay or if anything comes up during. Thanks Kara! As "model guests", you are ALWAYS welcome here and we hope to have the opportunity to host you yet again in the near future! Close to river rafting, gold panning, local lakes and rivers. Historic area. Auburn (close) has everything from quaint, historic buildings, wonderful restaurants, art galleries, golf courses, anything needed for wonderful experiences. Snow skiing also fairly close in the winter, and cross country/snow family fun right here and more above our town! You most likely will not need a 4 wheel drive vehicle to reach the property. Additional Guest Fee applies persons ages 0 to 100 yrs. liability purposes. 5+ guests for 5+ days subject to additional $100.00 cleaning fee. Rates subject to change. All requests submitted to Owner in writing. Additional services listed will be paid separately. Absolutely NO PETS, NO INDOOR SMOKING. Separate Rental Agreement must be signed and returned to owner with payment or prior to check-in. All terms of Rental Agreement/Departure Checklist are acknowledged and agreed to by booking this property, whether signed or not. LIABILITIES/ACKNOWLEDGEMENTS/RELEASE/INDEMNIFY: This home is privately owned. By entering into this agreement, Tenant acknowledges the contents of this Agreement, and agrees to assume all risks and liabilities for themselves, their visitors and anyone invited on the premises by Tenant or their visitors for any reason, including but not limited to: a. Accidents, injuries, illness and/or death, or any incidents that may occur under any circumstance while on the premises, including, but not limited to, parking areas, walkways, stairs, forested areas, pool and surrounding areas, and the property facilities, or traveling to and from premises; b. Loss or damage (vehicles included) of personal belongings or valuables of Tenants and Guests/Visitors. By accepting this reservation/entering into this Agreement, it is solely at the Tenants and Guests/Visitors own risk. It is agreed that all Tenants and Guests/Visitors are assuming any and all risk of liability and harm arising from their use of the premises, or otherwise on/in/around/near/to and from the premises. Tenants entering into this Agreement are directly responsible for their Guests/Visitors, and assume all risk and liability associated therewith. Tenants agree to hold harmless, release and indemnify Owner, including, but not limited to, all affiliations. All terms and conditions shall be governed and construed under laws of Placer County, California, and in the State of California.